The delicate skin under the eyes often shows dark circles, puffiness and wrinkles that make you look older than your calendar years. Positive habits such as wearing sunscreen, gently removing eye makeup daily, drinking ample water and sleeping seven to nine hours nightly help you maintain healthy looking skin everywhere, including underneath your eyes. While no food can banish under eye circles once you wake up with them, maintaining a healthy diet rich in antioxidants, omega-3 fatty acids, vitamin C and minerals, makes it likely you'll sport a healthy glow most days. Dark circles under the eyes appear because of hyper-pigmentation of the skin, age and heredity. The skin under the eyes is so thin that it looks dark whenever blood vessels in the area flood, due to inflammation caused by seasonal allergies, poor life habits or deep fatigue. Once the blood vessels are filled, topical treatments such as cold teabags, cucumber slices or even a bag of frozen peas, can help blood vessels constrict and look less obvious. 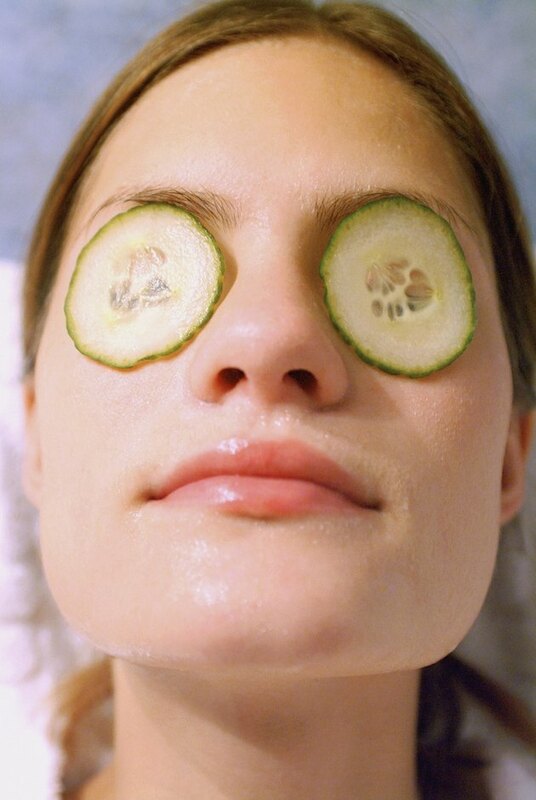 What you eat, though, won't help these dark circles, once they've set in for the day. A diet that makes your body, particularly your skin, less vulnerable to inflammation may help you ward off dark circles. Include plenty of fresh vegetables and fruits -- especially those with color, such as broccoli, papaya and sweet potatoes, to flood your body with antioxidants, which are compounds that fight free radicals. Your body comes into constant contact with free radicals from pollution, sunlight and from smoking. Fruits, such as strawberries and citrus, contain high levels of the antioxidant vitamin C, while fish and tomatoes provide you with the antioxidant and trace mineral selenium. Avoid processed foods and fried foods, as they tend to be full of chemicals and preservatives that contribute to your free-radical load and don't provide much in the way of antioxidant nutrition. A dry face is more prone to showing dark circles. Healthy fats, found in avocados, nuts and seeds, offer fatty acids that help keep your skin moisturized. Omega-3 fats such as those prevalent in walnuts, flax and fatty fish -- like salmon -- offer more antioxidant power to help your body fight the inflammation that may cause dark circles. Staying hydrated can also help your skin maintain moisture. Sometimes, dark circles are the result of a face that has become gaunt and has lost volume in the region under the eye. Shadows then make the region look dark and make you look tired and old. You can't always control the regions from where you lose weight, but you can avoid crash dieting and yo-yo dieting, both of which exact a toll on your skin. If you're not overweight, eat enough calories to support your daily activity. Even if you're cutting back and you hope to drop a few pounds, make sure the calories you eat come from quality sources such as fruits, vegetables and lean protein. What Foods Bring Color to Your Face?